Evanston Police Department officers at the 800 block of Emerson street. A crane set up on the site dropped a steel beam on two construction workers on Thursday. 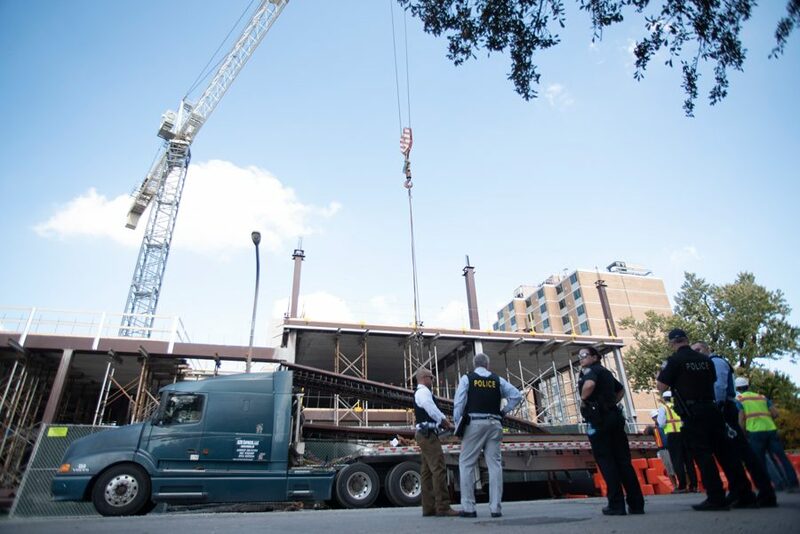 One construction worker was killed and another injured after a steel beam fell at a construction site in Evanston on Tuesday. Construction workers were unloading steel beams from a truck at 8:25 a.m. for use in a nine-story apartment building on the 800 block of Emerson when the crane rigging failed, said Evanston Police spokesman Perry Polinski. Evanston Fire Department said in a news release the the column dropped from a height of approximately 30 feet before striking the workers. The steel beam fell on two construction workers, aged 55 and 27, Polinski said. Both workers were rushed to Evanston Hospital. The 55-year-old worker, identified by the Cook County Medical Examiner’s Office as David Bialas of Compton, Illinois, was pronounced dead upon arrival. The 27-year-old man was pinned under the beam and extricated before being brought to the hospital, where he underwent surgery. On Tuesday afternoon, he was reported to be in serious but stable condition. Polinski said firefighters helped the crane operator get down from his post after the accident occurred, and that it was not immediately clear what caused the beam to fall. Officials from the federal Occupational Safety and Health Administration have opened an investigation into the incident. In a statement to various news outlets, OSHA spokeswoman Rhonda Burke said Bialas worked for Area Erectors Inc., a construction company with offices throughout Illinois. OSHA and Area Erectors were not immediately available for comment. Emerson Street between Maple and Sherman avenues is set to remain closed until noon Wednesday, according to a tweet from the city.